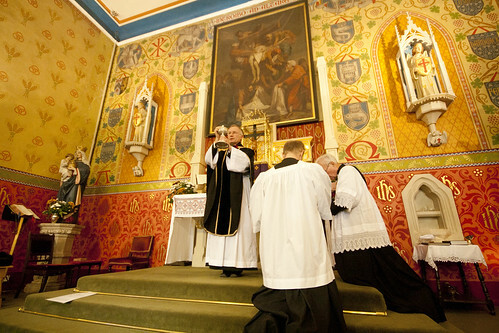 I have been very blessed in the last few days by being able to attend three beautiful and solemn Requiem Masses. 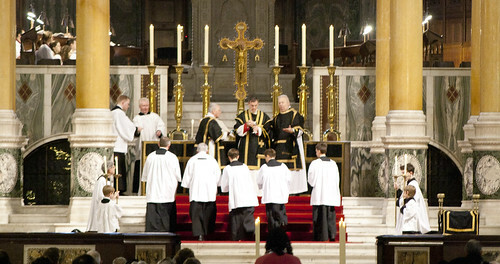 First, for All Souls, in SS Gregory & Augustine's, Oxford, where we had a High Mass. It was the deacon's first outing in the Extraordinary Form; he is a Benedictine, studying in Oxford. 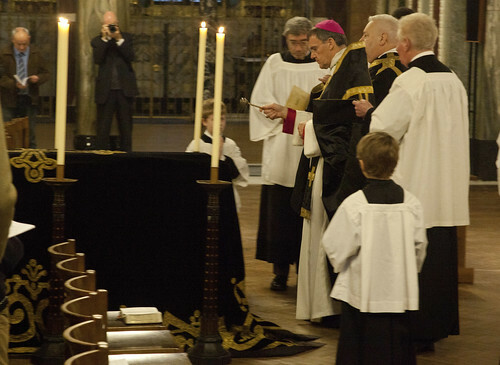 Yesterday it the Latin Mass Society's Annual Requiem in Westminster Cathedral, celebrated by Bishop John Arnold (whose appointment as Bishop of Salford has recently been announced; he hasn't yet taken possession of his see). I never cease to be astonished by Westminster Cathedral. To see a Pontifical Requiem in this great church is truly wonderful. Today (Sunday) is Remembrance Sunday, and we had our first Sung EF Mass in Holy Trinity, Hethe, outside Oxford, where Fr Paul Lester, the Parish Priest, has established a weekly Sunday Mass at 12 noon. 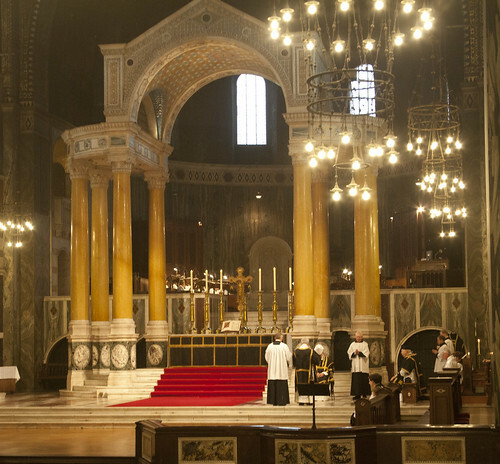 For overseas readers Remembrance Sunday is a peculiarity of England and Wales: by special permission, dating I think from 1918, we can have a Requiem Mass celebrated on the Sunday closest to 11th November. 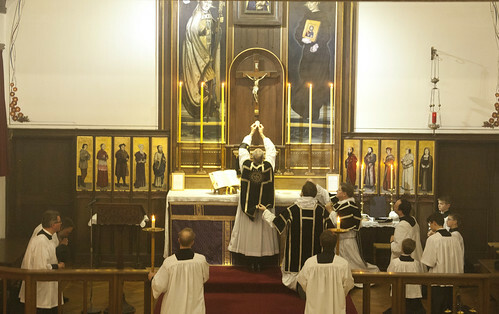 This is preceded, if it is the principal Mass on a Sunday, by the Asperges, and we have the Creed, which would never normally be recited at a Requiem. Remembrance Sunday services took place all over the country today, and of course is a very special year because of the centenary of start of the Great War. 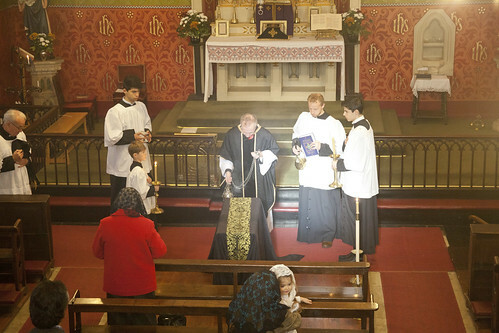 A local permanent deacon sang the Epistle, and we had the Absolutions at the Catafalque,with the chant Libera nos, a very moving ceremony in which the priest blesses an empty coffin, or simply a pall draped over a coffin stand, or just on the floor, representing the dead, with incense and holy water. 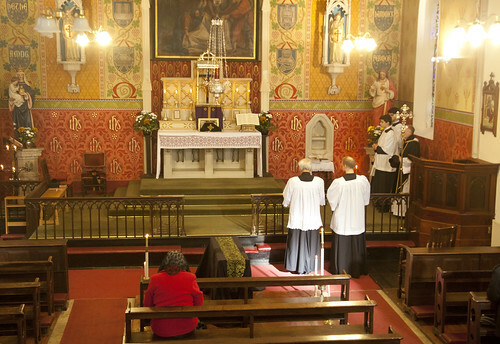 There will be more Requiems in November, of course, notably the annual Reuqiem I organise at St Benet's Hall (38 St Giles, Oxford OX1 3LN), which will take place on Saturday 29th November at 11:30am. 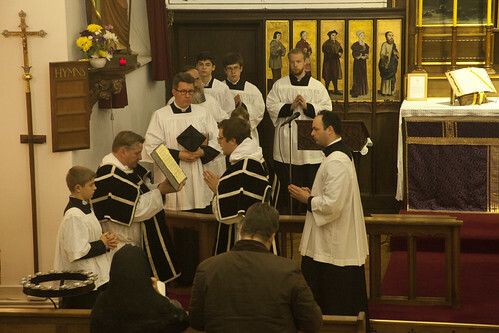 It's very neat to hear of a cleric assisting at a Missa Cantata to sing the Gospel.